Portfolio value is often highlighted and recognised as a key consideration in asset investment/divestment decisions or contract commitment business cases. However, it is often poorly defined and intangible, with little common understanding as to what the value actually refers to. But below the superficial considerations, portfolio impacts are very real and warrant explicit attention. Portfolio value is often highlighted and recognised as a key consideration in asset investment/divestment decisions or contract commitment business cases. However, this value is often poorly defined and intangible, with little common understanding as to what the value actually refers to. Even more questionable is the practice of assigning a value to portfolio impacts, which is then added to the asset valuation model output and directly used to justify investment commitments. But below the superficial considerations, portfolio impacts are very real and warrant explicit attention. One of the underlying principles of the mark to market valuation methodology is that the value of individual portfolio components (contracts or assets) can be summed to give the total value of the portfolio. Whilst this condition generally holds true in liquid markets it can break down in markets characterised by a strong physical focus and fragmented liquidity, conditions which are prevalent in gas and power markets. As such, when analysing structural portfolio changes or portfolio monetisation strategies, it is necessary to analyse the integrated portfolio as a whole and not just focus on the individual asset or contract. This is best illustrated with tangible examples. The addition of a shaped gas delivery to a portfolio can reduce overall value as it can tie up seasonal flexibility provided from swing or storage. This can reduce both intrinsic value (by limiting the amount of gas that can be sold into high price gas periods) and extrinsic value (by restricting the ability of the portfolio to be reoptimised in response to price movements). Buying incremental transportation capacity can allow gas to be bought and sold, and portfolio flexibility to be optimised against, new traded hubs. In many cases this incremental value will be a function of the dynamics of the existing portfolio. A contract to deliver firm cargoes may appear profitable on a standalone basis but the committed delivery is likely to reduce the overall portfolio flexibility by tying up previously flexible cargoes thereby eroding the extrinsic value of the portfolio. The value reduction due to loss of flexibility may be greater than the margin gained from the new contract. Many upstream LNG contracts contain provisions that allow the producer to share the upside generated from cargo diversions. It is common for the upside sharing value to be specified as a function of the destination market. In these situations purchasing regas capacity for a new market will mean the value capacity purchase is intricately linked with the purchase contract and different from the value of the capacity on a standalone basis. Effective operation of a retail electricity supply business requires access to short term flexibility to meet fluctuations in retail load. Short term market liquidity constraints restrict the ability of a portfolio manager to meet this flexibility requirement by trading in prompt markets alone. Most companies rely on flexible generation assets or contracted flexibility to service customer load. This cross-asset internal portfolio hedging impacts the standalone valuation of the portfolio assets against the market. Some gas contracts linked to power stations have re-sale restrictions. In these cases the value of the contract will be directly connected to the operation (optimisation and hedging) of the plant. As such, the valuation of the contract, or for that matter the plant, cannot be considered in isolation. A similar issue arises when there are liquidity or transmission capacity constraints which impact the resale of contracted gas at a hub. All of these examples can be characterised by either tightening or relaxing constraints on the overall portfolio, or in other words decreasing or increasing portfolio flexibility. On an intrinsic basis, changes to the overall portfolio flexibility impact the ability of the portfolio to be optimised against forward prices to extract maximum value. Equally important, the changes impact the ability of the portfolio to be reoptimised in response to price movements thereby changing the portfolio’s extrinsic value. 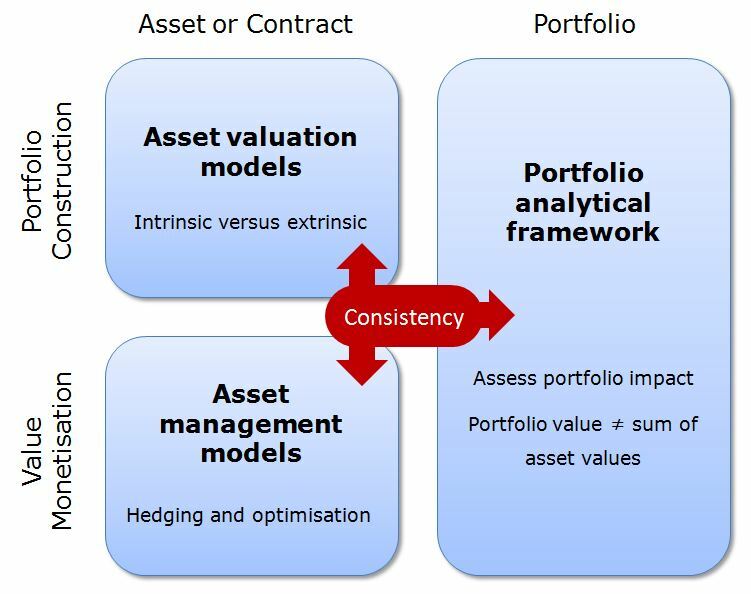 The standalone value of the contract or asset under analysis needs to be offset against the combined impact on the portfolio intrinsic and extrinsic value. When developing an approach to analyse a portfolio it is important to consider how it fits into a wider analytical framework. It is unrealistic to expect portfolio analysis to directly replace the requirement for a standalone valuation or asset operating model. Rather, portfolio analysis supplements individual asset analysis to help understand the impact the new asset or contract has on the existing portfolio. The diagram below presents a simple schematic of an analytical framework. Full stochastic model to assess portfolio value and risk resulting from portfolio hedging and optimisation under commodity price dynamics. Although the temptation may be to jump straight to the most complex modelling, often the greatest benefits will be realised by setting out a consistent way of describing the portfolio to facilitate a common understanding across all business teams. Often jumping directly to a complex stochastic model may yield results that are difficult to validate. More importantly this bypasses the important process of building up a shared knowledge of complex portfolio dynamics and characteristics. However, the critical consideration is to ensure consistency across all elements of the analytical framework. Failure to do so increases the risk of reaching erroneous insights and conclusions from the portfolio analysis.